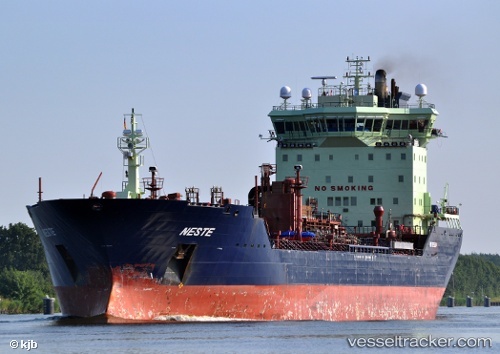 The M/V Varnebank, a Dutch freighter, struck the stern of a Neste Oil tanker, the M/T Neste, which was carrying a part cargo of diesel fuel, south of Kemi in the Bay of Bothnia at 18.05 EET on Tuesday, 16 April, the tanker owner said in a press release. Both vessels were following a route indicated by the icebreaker Odin when the M/T Neste became stuck in the ice. It was after this that the M/V Varnebank hit the stern of the tanker. The collision was of a minor nature and did not injure anyone or result in any damage to the environment. Crew of the Urho, another icebreaker, checked both vessels for damage and gave them permission to continue to the next port, where a more detailed examination will be carried out. The authorities will carry out an investigation of the chain of events that led up to the collision.